The competition was really steep! What amazing talent! I was really honored to have my piece go up such talented designs. A big "GREAT JOB!" goes out to my fellow challengers! I encourage you to enter next month's challenge. CLICK HERE to check out the Design Challenge Calendar. I'm emerging from my "hiatus" to check in. Firstly, I wanted to thank everyone for their birthday wishes! It is always appreciated. Thank you! One year slips into the next and it seems strange that another turn of the wheel in my personal history has made a revolution. Lately, I've been focused on my work and these great big transitions happening. I've also been enjoying time with my family. My attention has been myopic and introverted. I want to apologize for that, but I can't bring myself to. Maybe because the days have been so full lately, there's no room for apologies. I'll start updating regularly soon. But not yet. I'm going to wriggle around in my country quiet a little bit longer and breathe a little deeper and trace the clouds and sing to myself. And thanks again for all the many birthday wishes! To be completely honest, I was a little jealous of the fabulous goodie bags the students got. They got so many treasures from all over the country! Sure, it was nice to give them away... but I wanted one too! Anne Lichtenstein of Gardanne Beads must have sensed it in the Force, because she created a little goodie bag just for me! In it, she included a mix of her glass and enameled components! Thank you, Anne! CLICK HERE to check out Anne's Etsy shop! She has a fabulous collection of pretty components perfect for your next jewelry creation! Here's a picture of Gail's trunk show set up in Allegory Gallery. Isn't her work beautiful? Gail had such an amazing selection of innovative pieces. That's what I love about her work – it's always evolving and growing. She also had an array of her vintage sequins available. This is a shot of Gail demonstrating a technique during the Sunday morning mold-making class. In the shot with Gail are (from left to right) Lynne, the back of Anne, (Gail of course) and Nancy. These lovely ladies took all four classes with Gail this weekend. From left to right: Nancy, Anne, Joan, Gail, Baba, and Dawn. What an incredible bunch of women! I enjoyed getting to know all of them better over the course of the weekend. It was so nice to spend time with Gail. It's so rare that I get to see her, let alone spend exorbitant amounts of time with her. Our problem is that we talk too much and ended up staying up way too late every night! It was most excellent to see her though and host her wonderful workshops. After the workshops were over, we went across the street for dinner at The Kitchen on Main. They just opened for dinner and we were lucky to get reservations. It was a nice way to end the weekend. Good company and good food. In the photo above (from left to right) Anne, Baba, Dawn, Joan, Nancy and William. Over the years, I've grown to love some of them and it's such a treat when we take a break from our everyday lives and gather. It's like there's sparklers in the air. I can feel the creativity roiling. It always stings a little when something like this is over. I know that everyone will be on their way to their homes scattered across the country. I try not to get depressed and try to think about the next time I'll see them. This was also a wonderful opportunity to meet new people! I can't wait until our spring event, when I can hopefully summon them all back again! I will distract myself from missing them with pictures of the food we had that night! Above are some toasted brie cakes we had with a cranberry relish. This was what William had for dinner and I could help but take a bite. It was the slow roasted Berkshire pork shank with an apple and bacon salad. The pork melted like butter and the apple cider glaze was a perfect balance of sweet and tangy. I had the cedar planked Scottish Salmon. It too was mouthwateringly delicious. It was served with squash and roasted green beans. I felt like licking the plate, but I didn't want to shame my dinner companions. We couldn't pass up dessert! William had (with my help) a mini chocolate cake with a caramel sea salt sauce and homemade raspberry ice cream. I had the espresso flan with the vanilla creme anglaise with the nutty caramel ribbon. The flan was smooth and custardy with a mellow coffee undertone. That's another item on the menu that was plate-licking-worthy. Dawn was such a peach to offer some of her angel food cake with peaches and whipped cream for me to try. And try I did! The cake was the perfect cloud to sop up the syrupy sweetness of the peaches. The fresh whipped cream rounded things out with a creamy smoothness. The weekend was such a success on so many levels. The people are my favorite part about these type of events. These workshops bring the most amazing groups together and there's something magical when everyone is in one place. It's like everyone carries with them a secret ingredient and when they're together, it creates a creative soup of sorts... or a salmagundi. The flavor is completely unique and depends solely upon the chefs in the kitchen. I wanted to take a moment, like so many others out there, to remember. Today is September 11th and it marks the 11th anniversary. I was in the newsroom that day. I was working at the newspaper, putting together the final touches on issue, when reports started coming in. No one knew what was going on, least of all us. So many false reports were coming in, that the news of the Trade Towers being struck (and eventually falling) seemed just as impossible. Everyone around me sort of collectively inhaled and held their breath. A few ran from the room, pulling out their phones and dialing frantically. But most of us were glued to the spot, staring at the TV. We watched. We couldn't do anything, but watch. Personally, something happened. It was like there was this massive mental shift. Suddenly everything around me seemed so pointless. Frustrations with my prospects as a reporter came to a head and I made myself a promise. Go to New York. Help heal. Follow my passion. Don't waste a minute. And that's what I did. 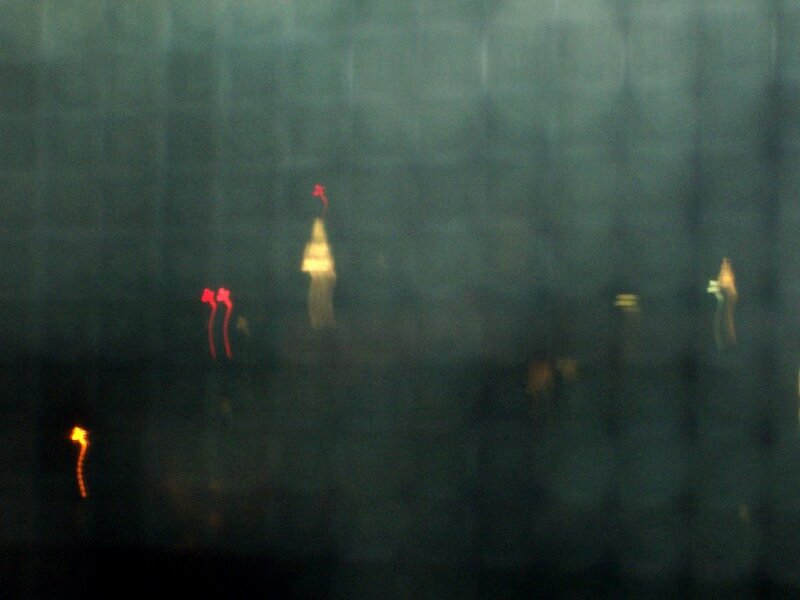 As soon as I could, I went to live in New York. I went to the epicenter to do what I had promised myself. It's odd how even though I'm miles and miles away from the life I used to have in the City, the events of that day are not far. In my memory, they are still vivid and close. But they are also not far in that Shanksville, the site of crash 93 in just down the road. From the biggest city, to the smallest town... this tragedy has touched us all. My heart goes out to all those who lost their lives and to the families and friends who lost their loved ones. Nina Designs has been generously hosting design challenges on their blog. Do you read their blog? It's loaded with lots of interesting content and has bountiful opportunities to win free merchandise! September's prompt was "Seven Moons Passing" by Susan Seddon-Boulet. I really liked this challenge! I am actually a big fan of Boulet's work and had one of her posters hanging in my bedroom when I was in high school. Apparently Sarah Michelle Gellar's iconic TV character, Buffy the Vampire Slayer, did too! I love the mystical and ethereal quality of Boulet's work and wanted to translate that into my interpretation. I used a muted color palette with pops of color, incorporating an eclectic mix of materials. To represent the moons, I used seven beads made out of white lotus seeds. 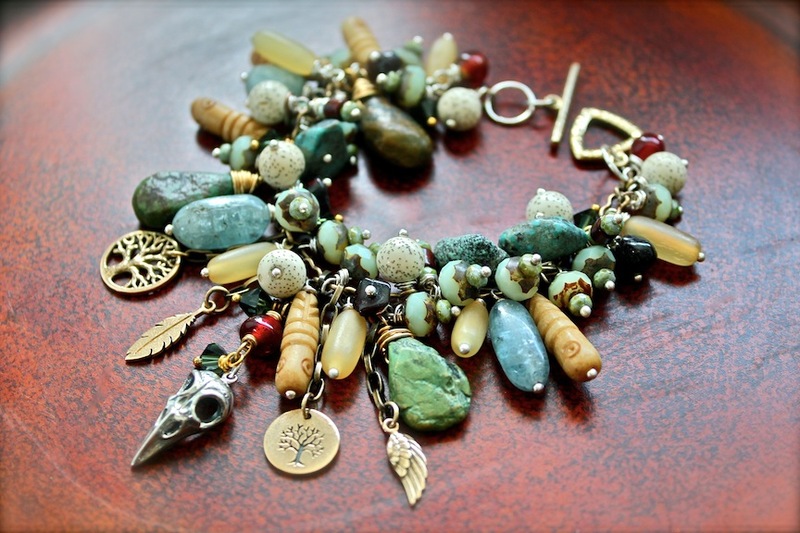 This "collected look" is the perfect backdrop to showcase the talismans and nature-themed charms from Nina Designs! The "eclectic mix" I mentioned is a combination of Swarovski crystals, pale kyanite, carved bone, golden horn, Czech glass, carnelian, rough turquoise, silver headpins, bronze charms, and sterling silver charms. I pulled it together with a bronze toggle from Nina Designs. The cool thing about this piece is that it can be worn as a bracelet, with lots of fun movement, or you can add a leather cord and wear it as a necklace. I used the same toggle set in the leather cord (not shown) and it fits together nicely! I love versatile pieces like that! Anyway, if you'd be so kind as to vote for my piece, "Night of the Shaman", I would appreciate it greatly! There are some really lovely pieces in this challenge, including one of the store's customers "Strength of Spirit". CLICK HERE to vote! Today was the first of the workshop and we had a wonderful day. I was manning the shop, so I just popped in from time to time with bottles of water and juice. It looked like everyone had fun and came away with lots of treasures. Here's Gail, Dawn, Nancy, Baba and Anne. Here's Jane West sporting one of Gail's amazing pieces. It got pretty busy! We had live music, Gail with her amazing pieces, and lots of food and wine. It was a most excellent time! It got pretty busy in the store. At one point there were about 30 people crammed in. But we all had a good time from what I could tell and hopefully this is the beginning of many good things to come. I would write more, but we've got an early and long day planned for tomorrow. So it's off to bed for me! Gail and Dawn met me at Fallingwater for a little pre-class fun! 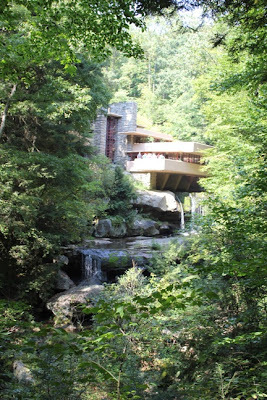 What a lovely (if not muggy) day to explore Frank Lloyd Wright's famous cantilevered house. Above is a shot of Gail in front of some incredible emerald-green moss. What I loved about this house the most was that it was based on "human scale"... which just happened to be my height! While some of the other tour members had to duck, I was perfectly at ease at the house designed for someone 5 foot 8 inches tall! Another thing that I really enjoyed about the house was all the light and openness. The living quarters were much smaller than what most people would be comfortable nowadays (though I thought the rooms were cozy), but there was such an integration with the outdoors that it almost felt like living out in the woods and that the small rooms were just nooks to a greater room... the great outdoors. Here's a nice shot of Dawn at the entrance to the house. Isn't she pretty? You can see "the Hatch" which opens up to a plunge pool down below. And if you really look, you can sort of see some of the furniture inside. (Well, you can see some people standing in front of the furniture inside.) We weren't allowed to take pictures inside, otherwise I would have a huge post on just that. I love all the furnishings. We were told that they were the "country house stuff" and that a lot of the pieces were the kind of stuff you'd use to furnish a cabin in the woods... the stuff not up to snuff to furnish your regular house. Of course, in this case, their "shabbier fixtures" included things like Diego Rivera paintings, signed Picasso prints, abundant Tiffany glass and 14th century Madonnas. And here's the iconic view of Fallingwater. We tried to find the crypt, but the property is so large that we didn't know where to begin to look. I was curious to see the bronze doors. It was a great day. Beautiful and filled with good company. And here's a teaser of the goodie bags for the class. Yup! All those boxes and bags are for the students! Gail helped me play "Santa" and divvy up the goods. Can't wait to meet all the students and get the Weekend Intensive with Gail Crosman Moore rolling! Some of your may know "Kai Botak" by a different name. For many of you in the bead world, you probably know her as "Kelly" or "that girl from Kabela". Besides being a talented jewelry-maker and a friendly face, she's also a talented musician working on her second album. You can help her achieve her goal by pledging in her Kickstarter fundraiser. She's only got a few days left to reach her goal. If her goal isn't met, she won't get a single penny from the pledges already made. It's hard to follow your dreams... but with the help of the community, even the impossible can happen. Help this soulful performer make her dream come true. 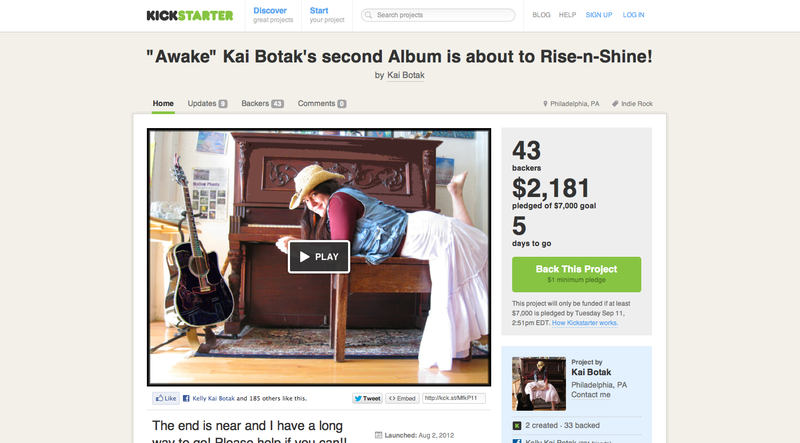 CLICK HERE to find out more about Kai's Kickstarter Fundraiser and her new album. Time has been slipping by so quickly. They say that Labor Day is the unofficial end of summer; it has come and gone and we're headed straight towards the official start of autumn with no signs of slowing down. This is a busy time of year. I have a list of things that I should be doing... a list of things that I need to do. But I took a few moments today to stop and enjoy a short reprieve. I know it's cliche to "stop and smell the roses"... but that's exactly what I did. Instead of "roses" though, I took time to admire the hydrangea, dahlias, and toad lilies. The love of plants is a worthy passion that I do not get to indulge often enough. Things are moving so quickly, it's easy to loose footing and be swept up. It's hard to stand still and be present and just appreciate the moment. I can't complain though. My life is a blur, because of this incredible energy and forward momentum. I really am blessed to have everything falling into place. I have to remind myself of just how fortunate I am to be living a creative life and being able to share that with others and hopefully spark inspiration elsewhere. It's a gift. The stillness affords time to reflect. It gives the opportunity to be grateful and not merely "do". Looking at the blossoms, I am reminded how short a season we all have. Soon those bright colors will fade and fall to the ground. We must relish what we have while we have it. Yip yip! This is Appa, our new car. Originally we were going to name it "Prim" as a sort of abbreviation of "persimmon". (The picture makes it look red, but it's actually a coppery orange color like a persimmon.) But the name didn't stick and instead we named it after a sky bison in (the animated series) Avatar. I think we might need a fuzzy white steering wheel cover or some horns or an arrow decal! 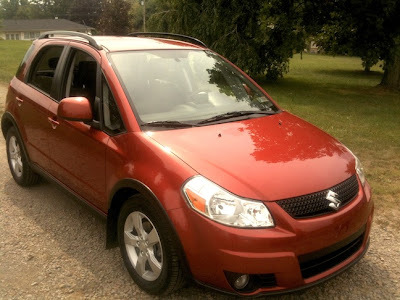 Our other car needs some much needed rest and relaxation... aka getting the gas tank replaced, body work done, new fuel filter, new tires, new muffler... etc. So Appa's arrival comes at a good time! Driving Appa is kind of weird. I'm not used to driving around in a car this new. I feel like that driver in that commercial (for what, I can't remember now) where they are in a parking lot and the shopping carts are all out to get the car and are swarming it and trying to ding it up; the driver has to do some fast-action moves to avoid getting damaged and narrowly escapes. It's also a different experience, because I'm not in a constant state of paranoid prayer... willing with the power of my mind and hoping that the car won't break down or the tires won't catch on fire or that it'll make it up a hill without dying on the side of the road. I'm excited to see all the places that we'll go. These are perhaps the most dramatic of the transformation pictures thus far. Day Four included us working on scraping more of the wallpaper residue off, filling nail holes and priming the walls. I'm not a huge fan of the wood paneling, so the paint will do a lot in transforming the space from something dark and dated... to bright and more contemporary. The more we chatted, I think we agreed to keep the paint colors as light as possible to keep the room feeling as bright and big as it could potentially be. I'd love to add some airy elements like low-maintainence houseplants like staghorn ferns and bamboo. And I also think we'll be using the psychedelic orange/brown "tigery" paisley print carpet. Design inspiration...the Sun! 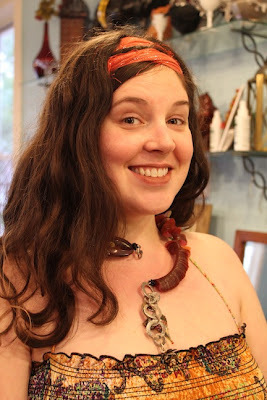 Lisa shares her Ode to the Sunshine State jewelry project. Dig around in your jewelry box for those hoop earrings that need a little jazzing up. School season is almost here and that inspired Erin to blog about some of her favorite creative classes she has taken over the years. Win a copy of Japanese Beadwork with Sonoko Nozue. While you're entering, you can also download a free simple spiral necklace project from the book. A litte paper and paint can result in a wonderful Frida pendant! 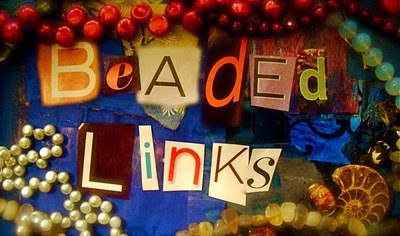 Jean discusses the worldwide jewelry, mixed media and Blythe doll project which she has been involved in throughout 2012, and invites you to follow its progress! Andrew announces the future plans for Allegory Gallery and the NEW annex space! I started this process awhile ago, but haven't had time to really finish. I'm working towards clearing out as much stuff as possible before my studio is packed up and moved over to the new place. An excellent opportunity came up with the Creative Bead Chat group on Facebook to destash everything, but unfortunately I came too late to the party and then had problems with the internet. So I missed out on a lot of goodies! Even without "officially" participating, I still wanted to get involved and help clear out some area. Part of the money raised will go towards a blog reader named Beth, who is facing having her home disappear out from under her. Part of the other funds will go towards Kelly Kai Botak of Kabela Designs to help her get her latest musical efforts turned into her second album. Whatever remains after that will go towards fixing up the Annex space. 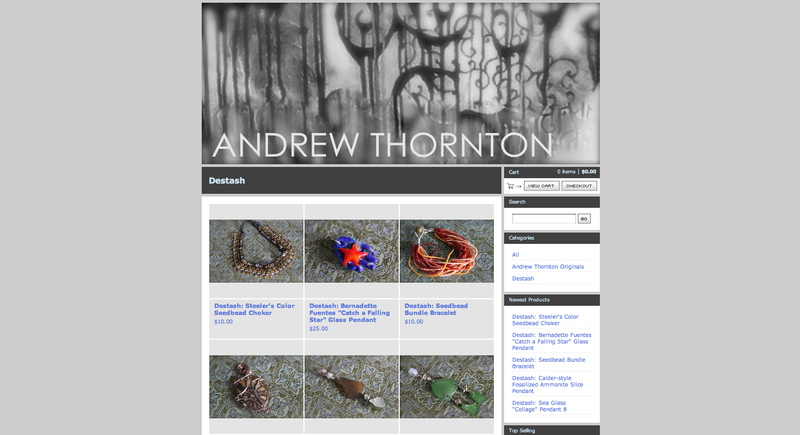 I'll be adding more items in the near future. UPDATE: Don't forget that the 50% off coupon code is still active! Use "SUMMERSALE" when checking out and save even more off these beautiful goodies!